Muslim women leave a polling station after casting their votes in Khatauli, Uttar Pradesh, India, on Thursday. Uttar Pradesh, India's most populous state, is led by a Hindu priest and has banned the consumption of beef and changed some city names to reflect Hindu heritage. Indian elections are often called the world's largest exercise in democracy. This month, nearly 900 million voters are eligible to cast ballots in national elections that started Thursday and will continue for more than five weeks. They are deciding whether or not to re-elect Prime Minister Narendra Modi and members of his ruling Bharatiya Janata Party, or BJP. Their votes will also make clear the country's level of support for a growing trend in India's politics: Hindu nationalism. "The shape of India is at stake," says Milan Vaishnav, who directs the South Asia Program at the Carnegie Endowment in Washington, D.C. "One of the important things this election is going to determine is India's future as a secular republic that embraces pluralism and adheres to the founders' notion that India's unity is strengthened by its diversity." Modi's record has been mixed: In his five years in office, India's economy has grown robustly, but unemployment has also risen to a 40-year high. There was an outbreak of violence this winter, when India exchanged airstrikes with its arch-rival and nuclear-armed neighbor, Pakistan. There has also been an elevation of Hindu-centric policy and discourse. Supporters call it Hindu pride, or Hindutva — Hindu-ness, the feeling of being Hindu. 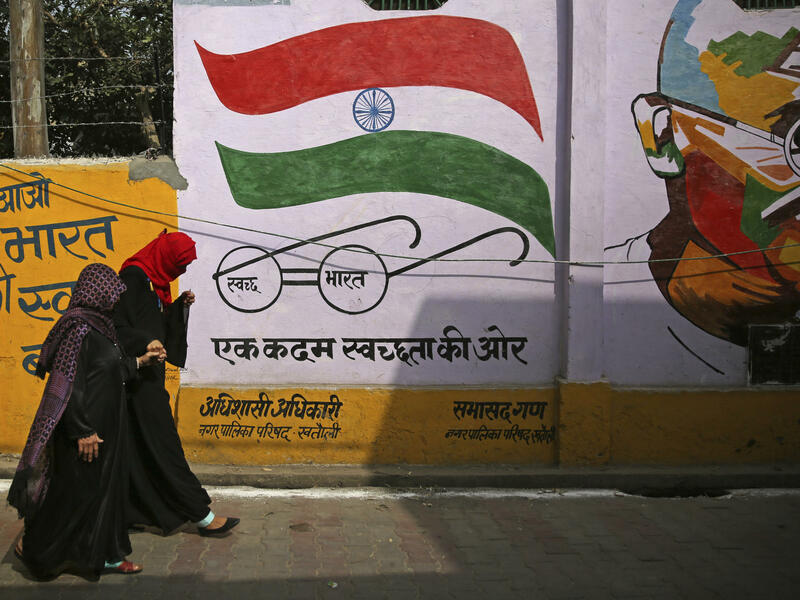 Others call it Hindu nationalism, an ideology of Hindu hegemony — and a danger to the republic. 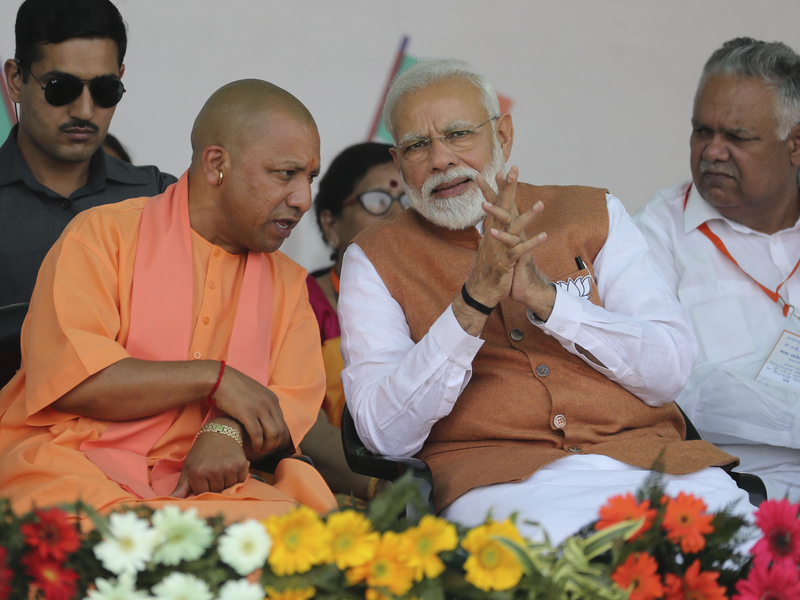 Indian Prime Minister Narendra Modi speaks with of Yogi Adityanath (left), a Hindu priest who is chief minister of Uttar Pradesh, during a campaign rally on March 28. While Hinduism is India's majority religion (almost 80 percent of Indians are Hindu), Hindu nationalism is political. It's the idea that Hindu faith and culture should help shape the state and its policies — and it negates the contributions of others. Hindu nationalism has roots in the 19th century, when it emerged as a backlash to the ideas of liberal Hindu reformers, British and Portuguese colonialism and Christian missionaries. It has gained prominence in the late 20th and early 21st centuries, especially under Modi and his Hindu nationalist BJP. But it's often at odds with the secularism enshrined in India's constitution. Many see this election as a turning point in which India may decide to redefine itself according to its majority Hindu faith. The last five years under Modi have seen shifts, both gradual and not, as Hindu nationalists have grown increasingly assertive, inserting their priorities into Indian policy, laws and daily life. The ideology of a Hindu nationalist group called the Rashtriya Swayamsevak Sangh (RSS) — where Modi spent his formative years — has become especially prominent in recent years. The RSS is an all-male Hindu volunteer corps that says it aims to promote Hinduism in civic life. But its critics accuse it of stirring hatred and violence toward India's minorities. One RSS priority that has become law in several Indian states in recent years is a ban on cow slaughter and the consumption or sale of beef. Hindus consider cows sacred. Police enforce the bans, punishable with up to 10 years in jail in some states or municipal fines in others. 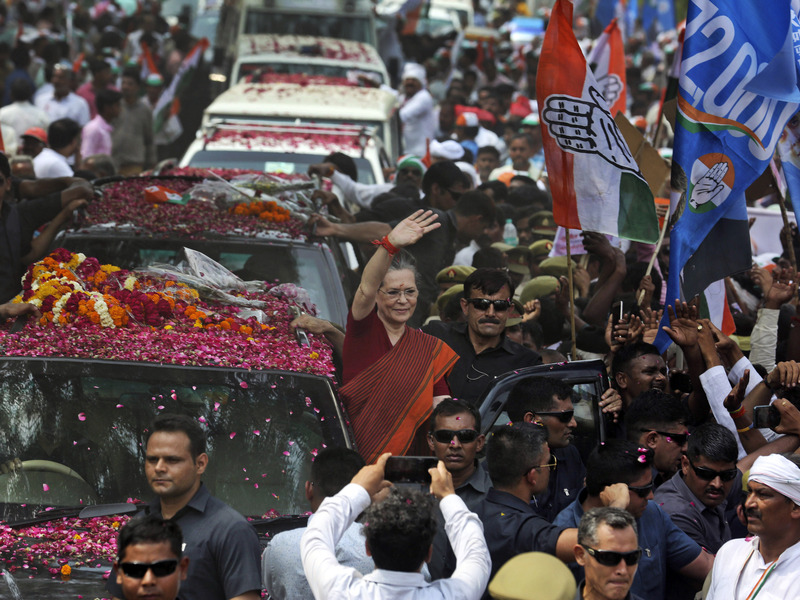 India's opposition Congress party leader Sonia Gandhi (center) waves as she arrives to file her nomination papers for elections, in Rae Bareli, Uttar Pradesh, India, on Thursday. The Congress party dominated Indian politics for much of the country's history but has been overshadowed in recent years by the Hindu nationalist BJP. But self-appointed cow vigilantes — laypeople, sometimes affiliated with the RSS or BJP — have also taken it upon themselves to investigate and sometimes attack and even kill people suspected of dealing in beef on the black market. The victims are often Muslims or lower-caste Hindus who traditionally consume and trade in beef and have been deprived of their livelihoods due to the new laws. There's been a rash of mob lynchings targeting those minorities in recent years. Between May 2015 and December 2018, at least 44 people — 36 of them Muslim — were killed in cow vigilante violence across 12 Indian states, according to Human Rights Watch. Hundreds more have been injured. Meanwhile, Hindu monks and priests have risen to power in politics and business. Baba Ramdev, a monk and yoga guru with close ties to Modi, runs of one of the fastest-growing consumer goods empires in India, selling food, cosmetics and medicine based on ancient Hindu healing traditions. The chief minister of Uttar Pradesh, India's most populous state, with more than 200 million residents, is a Hindu priest. Yogi Adityanath is a prominent member of Modi's party and a vocal Hindu nationalist, infamous for anti-Muslim rhetoric. His state government has enacted a beef ban and renamed cities and landmarks that previously had names rooted in Islam. For example, the city of Allahabad, built in the 16th century by Muslim rulers of the Mughal Empire, was officially renamed last year as Prayagraj, a word that references an earlier Hindu settlement and pilgrimage site there. Hindu nationalists argue that for centuries, British and Mughal dominance influenced how they view their own history — and they're now finally reinterpreting it through authentic Hindu eyes. 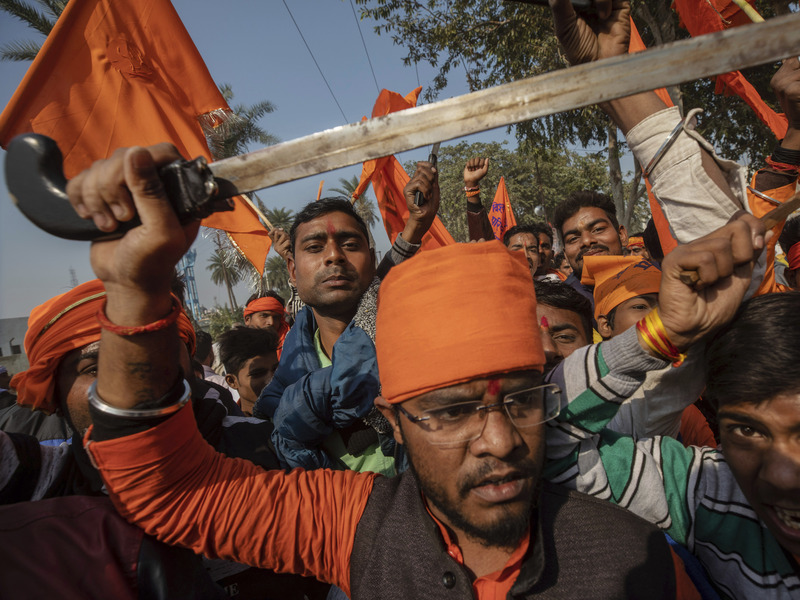 Hindu hard-liners, one holding a sword, chant slogans against Muslim communities during a Nov. 25, 2018, rally demanding a Hindu temple be built on a site in Ayodhya, where attackers in 1992 demolished a 16th century mosque. "India was subjugated under those Muslim rulers. People feel there was some injustice, and history has not been presented and narrated and understood in the way that it should have been understood," says Yogeshwar Tewari, head of the history department at Allahabad University (whose name remains unchanged for now). "Every nation goes through course correction." The extent of what Tewari calls "subjugation" of Hindus is a question that has divided historians. But for many Indian Hindus, Muslim place names are like Confederate statues in the American South — reminders of a painful history, some of which are now being removed. During parts of the Mughal era, some Hindu temples were desecrated or destroyed, and for a time, a tax was levied on non-Muslims. Others see the name changes as a dangerous process of erasing the history of an era in which the Mughals united India's disparate kingdoms, codified human rights and left behind some of the country's best-known architecture, including the Taj Mahal. Today, more than 180 million Muslims make up nearly one-sixth of India's population, a bigger proportion of India than African-Americans are in the U.S.
"What is very clear from the kinds of alliances being made for the elections is that the purpose is to consolidate the Hindu vote," says historian Romila Thapar, professor emerita at Jawaharlal Nehru University in New Delhi. "Minority groups are shunted out or subordinated. As long as the majority is in the ascendency, it doesn't really matter what the conditions for minorities are. Fifty years ago, 70 years ago, everyone was equal. Today, it's majoritarianism." That sense of Hindu primacy is squeezing other voices out, Thapar warns. "As rationalists, we are dismissed because we are told, 'You're not people of faith. You don't understand,'" she says. "Now the question is, is politics going to be run by people of faith?" In 1947, when India won its freedom from British colonial rule, the territory was partitioned into a new Muslim state — Pakistan — and a secular, pluralistic state, India. At the time, India's founding fathers — including the freedom fighter Mohandas Gandhi and Jawaharlal Nehru, who became the country's first prime minister — concluded that only a pluralistic democracy could hold together India's myriad ethnic groups, languages and castes. Hindu nationalists were outraged. They had lobbied unsuccessfully for a Hindu state, with laws to be shaped by Hindu scripture. They accused Gandhi and Nehru of appeasing minorities by treating them as equals to Hindus under the law. Months later, a Hindu nationalist assassinated Gandhi. Gandhi's death silenced any debate over his and Nehru's vision for a secular India. The RSS, to which Gandhi's assassin belonged, was banned after the murder — the first of three RSS bans, though all have been overturned and the group remains legal today. Nehru's daughter Indira Gandhi and grandson Rajiv Gandhi went on to become elected prime ministers of India with the Congress party, which has dominated Indian politics for most of the post-independence era. India voted the Hindu nationalist BJP into power briefly in 1996, and then again in 1998 and 2014. If Modi is reelected this spring and serves another full five-year term, his would be the longest streak of non-Congress party rule in modern Indian history. These days, even major secular political parties like the Congress party don't talk about secularism anymore, says Vaishnav. "One of the most remarkable things about the 2019 election is how little opposition politicians are talking about secularism. It's a four-letter word," he says. "That's something that BJP and its Hindu nationalist allies have succeeded in bringing about." The question now is whether Indians voting over the next five weeks will endorse that vision for their country.